Michele with some furry friends! For close to 20 years I have been running multiple pet care and training businesses in the Rochester and surrounding areas. I have a passion for helping others with the training and care of their canine companions. Thousands of students have had great success with my positive approach training style. My boarding accommodations have always been stress-free and limited to ensure everyone has a great experience. I have a certification from an accredited dog training college; Animal Behavior College. I’ve also have taken countless continuing education courses and certifications on animal behavior as I am an education junkie. I’ve studied under renowned trainers too. I love to learn. The more I learn, the better I can service my clients! My goal as a trainer is to teach dog owners how to communicate better with their dog. I want to teach them how to speak their dog’s language or at least start to understand what their dog is telling them. I teach all my students about my three favorite training words; Guidance, Consistency, and Exercise. If we can master all three, we can have a great family companion! I currently live just outside the city of Rochester with my amazing family and 2 dogs; Harper (Great Dane) and Keegan (Irish Wolfhound). 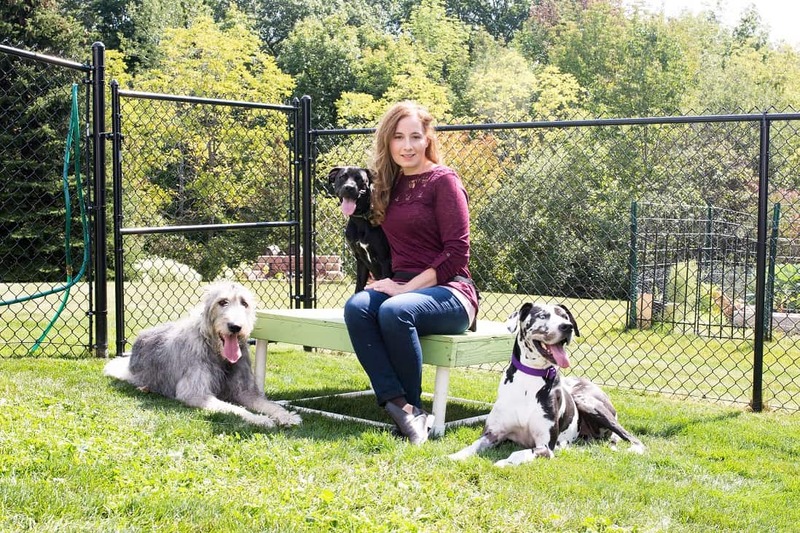 What began as a part-time vet assistant position many years ago grew into a full-time passion for learning all things ‘DOG’ and teaching others how to care for their canine companion. I look forward to helping you and your furry friend be the best team possible.